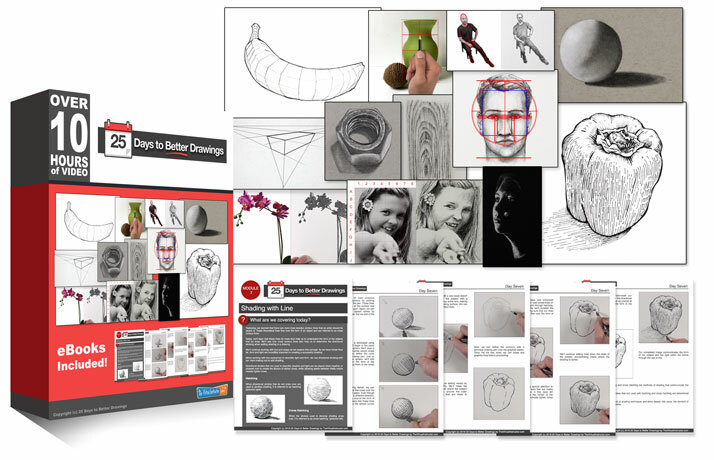 Description: Learn how to break complex subjects down into easy to draw shapes. Apply this concept to a complex subject with a drawing exercise. Suggested Materials: Graphite drawing pencil and white drawing paper. Pena não consegui ver o Matt contornando as forma, pois o vídeo congelou a imagem nessa fase. Although I know how to draw, I didn’t practice for a long time. This lesson was somehow frustrated to me. Do you think with practicing this method, I will get better and start to be natural? First of all happy 2019 to all! One the problems for me here was that the cube in the middle is already somewhat distorted – to start from that is quite frustrating. Then when I was drawing from what I saw – without pencil measuring – the initial drawing was somewhat longer and I didn’t like it, the second one looked more compact and smaller than the photo – but it was more ok dimension wise. Does your eye also plays tricks on you esp. when it comes to dimensions? Breaking down to geometrical forms is a great help. I am using 25 Days as a systematic review of the basics as I think perhaps I have missed out on account of having much early experience learning with Betty Edwards’Right Side of the Brain’approach. I found the object we drew for this lesson a real challenge until I simply started at a point and in a direction of my own choosing. I do enjoy your video demonstrations, though. Thank you Mat for this great excercise. I really like your approach and enjoyed this 4th day. And after having observed the object for quite a while I actually noticed that I could have made my life even a little easier, because actually the sculpture contains of 3 lines, that do cross each other and so a) I was able to find the center and was b) better able to keep the right dimensions and the right lenght and right angle. And then I started to work on the actual shapes. I hope I was able to explain myself. It would be a great help in these cases to upload a picture as this would have made everything clearer. hello Matt maybe you are not aware how extremely helpful this course is for me. the lessons themselves are a joy the way you are teaching is encouraging and the concept itself is logical. l take my time and try to practice every lesson for a week at least one exercise with own “models” per day. I feel for the first time since i started to learn art on my own this method is really helping me progress in drawing. I am taking my time to exercise along with this course and looking forward to continue with your other drawing courses later on like the graphite course or the portrait course or the pen and ink course.